Saturday brings something of a cultural feast on the Bates campus, with performances by the Bates College Orchestra, former Phish guitarist Trey Anastasio and the Modern Dance Company — which also performs Sunday and Monday. In its debut performance conducted by award-winning musician Hiroya Miura, the orchestra offers music by Bartok and Beethoven at 7:30 p.m. Saturday, Nov. 12, in Olin Arts Center Concert Hall, 75 Russell St. Please note that contrary to some published reports, 7:30 p.m. is the correct concert time. In a sold-out show, this time in the Clifton Daggett Gray Athletic Building, Anastasio also takes the stage at 7:30 p.m. Saturday. The concert will showcase music from Shine, Anastasio’s first full-length album of new material since Phish broke up in 2004. Also on the program is the up-and-coming Bay Area band Tea Leaf Green. For Open Borders, its annual fall concert, the Modern Dance Company’s program includes work by two internationally known visiting choreographers and by Carol Dilley, director of dance at Bates. Performances are at 5 p.m. Saturday, 2 p.m. Sunday, Nov. 13, and 8 p.m. Monday, Nov. 14, in Schaeffer Theatre, 305 College St. Admission is $6 ($3 for seniors, children and non-Bates students). For more information, please call 207-786-6161. Miura and the Bates orchestra will perform Bartok’s Romanian Folk Dances and Beethoven’s Symphony No. 7. Both pieces were at least partially inspired by folk music, Miura says. “I thought it would be interesting to program pieces together that were composed almost exactly 100 years apart — 1812 and 1915,” he says. New to the faculty, Miura has worked as a composer, conductor and improvisational musician in Canada and the United States. In addition to his conducting duties, he teaches composition and music theory at Bates. Miura is a native of Sendai, Japan. His works have been performed by artists including such acclaimed groups as Speculum Musicae, the New York New Music Ensemble and So Percussion. He is a founding member of the electronic improvisation unit, NoOneReceiving, whose debut album The Release of the Wandering-Eyed Girl (Grain of Sound, 2002) earned critical acclaim in Europe and the United States. Dilley’s works are set to music composed by William Matthews, the Alice Swanson Esty Professor of Music at Bates. Curran’s piece will be performed to live music composed by Mozart and played by Akiko Doi, a pianist and Bates senior; Jessica Gagne-Hall, a violinist and 2004 Bates graduate; and Emily Thomas, a cellist who lives in Cumberland. “It’s a rare and wonderful experience for both the dancers and the audience to get live music for a dance concert,” said Dilley. Curran comes to Bates through a National College Choreographer Initiative grant to facilitate greater interaction between professional choreographers and academic institutions. He has performed and choreographed dances for venues across the United States and in Europe, and received a 2002 Choreographer’s Fellowship from the New York Foundation for the Arts. Curran has taught at the American Dance Festival, Harvard Summer Dance Program, Bates Dance Festival and the Boston Conservatory. Ovares, internationally renowned as a choreographer, actor, teacher and dancer, is director of the National Dance Company of Costa Rica, and comes to Bates as part of an exchange between the two institutions. His work has been featured in Europe, Canada and Israel, and he has performed in Spain, Austria and Germany. 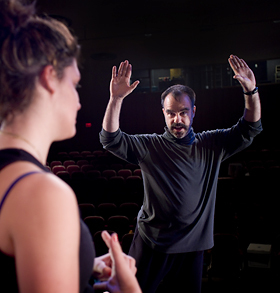 Dilley, artistic director of the Bates Modern Dance Company and director of the college’s dance program, has performed, choreographed and taught internationally for nearly 20 years. Her piece “79% de un Salario” will be performed in Costa Rica by the National Dance Company a week after the Bates performances, and again during a Central American tour in spring 2006.